This is an "in-person" signed program-menu. It has four pages, measures 9 x 12" and is titled on the front cover "Cocktails and Breakfast with Frankie at the Fontainebleau." The program has some light wear, some tape residue on the back cover along the top, and the lower four inches of the fold in the middle is split. There are numerous black and white photos on each page, several showing Sinatra with Eleanor Roosevelt and other celebrities. The menu is printed on the inside two pages. There is no date in the program, but I'm guessing this occurred around 1960. 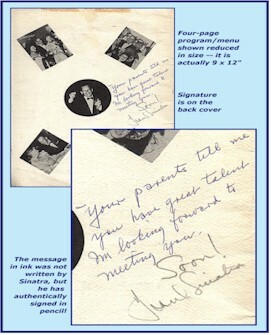 Someone -- not Sinatra -- has written in ink on the back cover, "Your parents tell me you have great talent. I'm looking forward to meeting you." Immediately below this, Sinatra has written and signed in dark pencil, "Soon! Frank Sinatra." Sinatra's authentic, in-person autographs are a real treat to find today. Absolute, FULL lifetime money back guarantee of authenticity!